UPI Middle East bureau chief Dalal Saoud speaks on international news agencies. 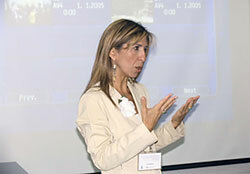 LBCI TV senior correspondent Tania Mehanna shares insights on interviews. AFP correspondent Nayla Razzouk discusses feature writing for the wires. 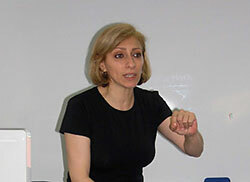 IPJ director Magda Abu-Fadil tackles media ethics and online journalism. 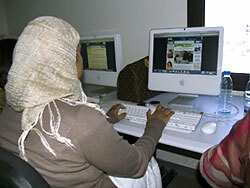 KUNA editors upgrade their skills in Beirut. 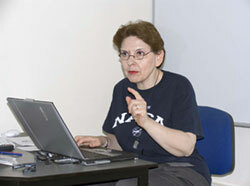 An-Nahar columnist/editor Sahar Baasiri focuses on newsroom management. KUNA editor learns more about online journalism. Dr. Mahmoud Tarabay runs vigorous exercises for Kuwaiti editors. KUNA participants receive IPJ certificates. Ten editors/reporters of the Kuwait News Agency’s Arabic service were put through the mill of tough training during a workshop organized by the Institute for Professional Journalists in Beirut to upgrade their writing, editing, management and online skills. 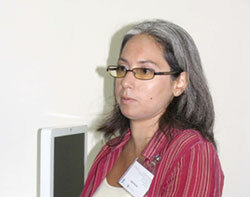 The intensive five-day course June 12–16, 2006 at LAU’s Beirut campus featured presentations by UPI Middle East bureau chief Dalal Saoud, LBCI TV senior correspondent Tania Mehanna, AFP correspondent Nayla Razzouk and An-Nahar columnist/editor Sahar Baasiri. Also on hand were IPJ director Magda Abu-Fadil, who led discussions on media ethics and online journalism and LAU/LU assistant professor Mahmoud Tarabay who led most other sessions and provided participants with hands-on exercises. The editors visited LBCI TV headquarters in Adma, north of Beirut, and marveled at the state-of-the-art news operation at Lebanon's leading television terrestrial and satellite station. They also toured Lebanon’s key Arabic-language daily, An-Nahar, and met with editors and reporters in various departments. IPJ hosted two dinners for the Kuwait editors with leading Lebanese journalists. The first featured Hazem El Amine, columnist and editor at the pan-Arab daily Al Hayat and the second grouped the Kuwaiti visitors with May Kahale, news director at Al Soumariya TV and a former presidential media adviser, and Sana El Jack, correspondent for the pan-Arab Saudi paper Asharq Al-Awsat who also writes a column for An-Nahar.